When the Street League was launched a couple of years ago, the more hard-core skateboarders of the core industry cried foul… The vast majority just took the wait-and-see stance and some few skaters hailed this as the best idea since the urethane wheels. There it is, The Steet League is now the biggest skateboarding competition in the history of skateboarding. The Street League DC Pro Tour Fueled by Monster Energy just completed its second year with resounding success, surpassing its previous year in all key measures. Bigger crowds, larger viewership, and unparalleled international media attention has proved that in just two short years, the league has solidified its position as the premier contest series for professional skateboarding worldwide. Millions of core skate participants and casual fans watched in awe as 16 year-old phenom Nyjah Huston edged out Street League stars Chris Cole and Ryan Sheckler to win the first three stops of the tour, only to be upset by Sean Malto in the Championship finale. Huston became the highest earning Street League pro and a household name in the process. With significant expansion in every category of the property’s media platform, 2011 has marked the year that the league has become the clear category leader in professional competitive skateboarding. Live attendance for the league marked the highest paid ticket sales for a street skateboarding series, with nearly 50,000 fans coming out to the four-stop nationwide tour – more than 300 percent growth in year-over-year total attendance. 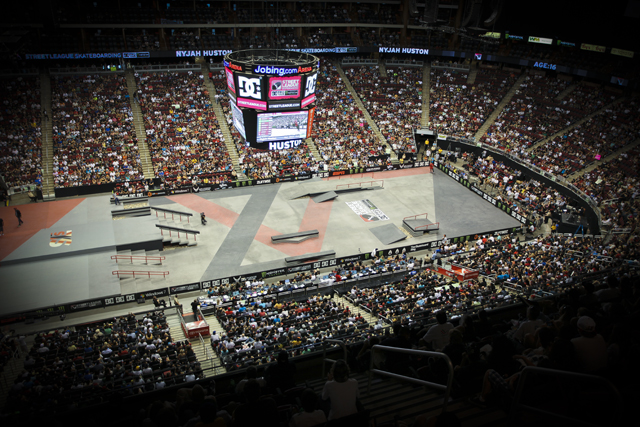 Domestically, Street League demonstrated 40 percent growth with more than 2.5 million viewers tuned in to ESPN, ESPN2, and ESPN3.com to watch 24 of the best skaters in the world battle it out for a $1.6 million dollar purse prize—the largest in skateboarding history. Abroad, millions more tuned in to the international league programming available in more than 198 countries via ESPN’s family of networks. After coming off of an unprecedented three-peat in the league, all eyes were on Huston for the winner-takes-all Championship at the Prudential Center in Newark, NJ, which featured the largest single 1st place prize in skateboarding history at $200,000. 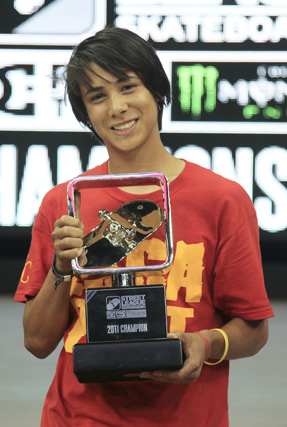 Battling it out with the top 10 pros in the league, it was Sean Malto in the end who finally put an end to Huston’s winning streak and won the title of 2011 Street League Champion. 2011 saw Nyjah Huston’s unprecedented win streak of taking the top spot at the first three stops. This nollie inward heelflip on his final attempt in Kansas City clenched the second win in a row. Representatives from the tour’s presenting sponsors DC and Monster Energy commented on the tour’s growth as well. “DC is very proud to be involved in such a revolutionary skateboarding competition," said DC’s VP of Marketing, Jeff Taylor. “Every year the skaters and talent get more and more impressive and remind us how far skateboarding has come.” Cody Dresser, Director of Action sports for Monster Energy, added, “Monster Energy is really impressed with the progress of the series in year two. We’ve had larger and more participatory crowds, excellent TV, and positive feedback from the pros and industry alike.